SAMS Odisha released a notification to fill up +2 Vacant Seat Admission of +2 Junior Government or Private Colleges in Odisha. The students can apply this +2 Vacant Seat admission 2018 process only online mode at official website samsodisha.gov.in from 23 August 2018 by submitting Fresh Common Application Form (CAF). 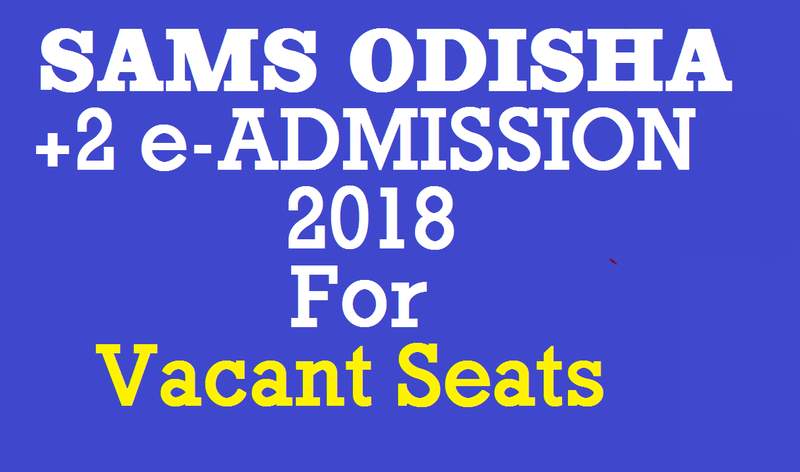 In this +2 Vacant Seat admission 2018 process only for those students who cannot take admission into +2 Junior Colleges of Odisha while the First phase +2 e-Admission 2018 and +2 Second phase e-admission 2018 process. Only two type categories students can apply +2 Vacant Seat admission 2018. First, those students having passed the supplementary Exam of BSE, Odisha or equivalent Board and Second those students who have not taken admission in +2 first e-admissions for various reasons. Fresh applicants need to register themselves first in the official website with their mobile no and email Id but students who are already registered at SAMS Portal earlier they need not register again. They can use their previous Registered Mobile number and password for applying CAF. Here are some key dates for you should know about these dates for applying online CAF at the official website. Note: Please read carefully official notice before applying. I hope you like this post very much and thanks for reading. Please visit regularly for more new updates. Share this post with your Friends or relatives. Join me also in Social Media.